Editors’ note: This article is Andrew Kliman’s response to David Harvey’s recent criticisms of Marx’s theory of capitalist economic crisis. It was originally published in New Left Project; Part 1 appeared on March 10, 2015 and Part 2 appeared on March 12. 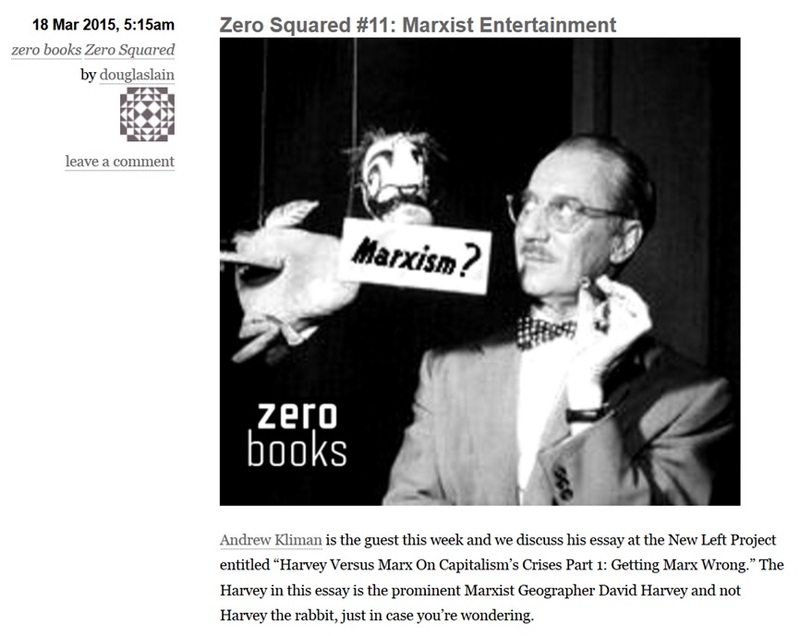 On Douglas Lain’s podcast, Zero Squared, he and Kliman discussed the article, the environment of “Marxist entertainment” in which errors such as those made by Harvey are common and flourish, and whether Marx’s crisis theory has practical political consequences. The hour-long discussion was preceded by a short clip in which Brendan Cooney talks about the Marx’s law of the tendential fall in the rate of profit, in which his crisis theory is rooted. You can listen to the podcast here. those who attribute the difficulties of contemporary capitalism to the tendency of the profit rate to fall are, judging by this evidence of labour participation, seriously mistaken. The conditions point to a vast increase and not a constriction in surplus value production and extraction. The data do indeed suggest that the mass—the absolute amount—of surplus-value or profit increased. But the issue here is what happened to the rate of profit, the amount of surplus-value or profit as a percentage of the volume of invested capital. An increase in the numerator of a ratio (rate) is not evidence that the ratio as a whole has increased. If the percentage increase in the denominator of the rate of profit, the invested capital, was greater than the percentage increase in the numerator, then the rate of profit fell. Given that Harvey does not show, and does not even suggest, that the denominator failed to increase by a greater percentage, the statistic he cites is just not evidence that the rate of profit rose. However, Harvey contends that the increase in employment is, by itself––irrespective of any increase in invested capital––crucial evidence that Marx’s LTFRP has not been operative since the early 1980s. ‘If the general theory of the tendency for profit rates to fall is correct, then the spread of labour-saving technological changes … should mean a tendency for the number of waged workers employed by capital to decrease. This was something that Marx himself freely acknowledged’. This is simply incorrect. The passage that Harvey cites in support of his claim that Marx ‘freely acknowledged’ that the LTFRP implies declining employment actually says that labour-saving technical change (‘the development of productivity’) ‘reduces the total quantity of labour applied by a given capital’. (Marx 1991a, pp. 355–56; emphasis added) ‘Applied by a given capital’ means ‘applied by a capital of given size’. If, for example, the invested capital is originally $1 million and 10 workers are employed, while later the invested capital is $4 million and 20 workers are employed, the number of workers employed ‘by a given capital’—e.g., per million dollars of capital—has fallen from 10 workers to 5. This does not mean what Harvey takes it to mean, namely that the absolute volume of employment has fallen. The absolute volume of employment has doubled, from 10 workers to 20. The fall in the rate of profit does not arise from an absolute decline in the variable component of the total capital but simply from a relative decline, from its decrease in comparison with the constant component. One would be hard pressed to put the point more definitively and emphatically. A rise in employment is just not evidence against the LTFRP. Nor did Marx vacillate between calling the LTFRP a ‘law’ and calling it a ‘law of a tendency’; he regarded all economic laws as laws of tendencies. In chapter 10 of volume 3 of Capital, for instance, he wrote, ‘We assume a general rate of surplus-value of this kind, as a tendency, like all economic laws …’. (Marx 1991a, p. 275) The point is simple enough: one cannot identify a law that accounts for every fluctuation in an economic variable like the rate of profit, because these fluctuations are not purely law-governed. They are affected by all manner of contingencies and impediments. One can only identify laws of the tendencies the variable exhibits amid and despite the contingencies and impediments. Yet Harvey has additional grounds for his belief that Marx was ambivalent about the LTFRP. For one thing, ‘Marx made no mention of any tendency of the rate of profit to fall in his political writings such as The Civil War in France’. The Civil War in France also makes no mention of any phenomena such as surplus labour and surplus-value. Would Harvey regard this absence as legitimate evidence that Marx had doubts about the existence of surplus labour or surplus-value? Would he regard it as justification for ‘long-standing skepticism about the[ir] general relevance’? Once we understand that Marx was referring to ruptures of commercial and financial relations when he used the term ‘crisis’, and that he recognised the existence of many intermediate links between the fall in the rate of profit and the outbreak of crisis, it is neither surprising nor particularly significant that he sometimes discussed crises in abstraction from the tendency of the rate of profit to fall. He was just being rigorous and dialectical, dealing with one thing at a time rather than creating a chaotic jumble by dealing with everything at once. Harvey also remarks that ‘Marx never went back to the falling rate of profit theory’ after 1868 and that ‘it does seem passing strange that Marx would chose to ignore in the last dozen years of his research what he had earlier dubbed in the Grundrisse as “the most important law of political economy”’. However, the inference that Marx ‘ignore[d]’ the LTFRP does not follow from the evidence. When I have resolved a theoretical or empirical question to my satisfaction, I don’t continue to dwell on it obsessively, but move on. That doesn’t mean that I ignore the answer I arrived at; I take it as given. The evidence suggests to me that Marx worked in a similar way. In what way does Harvey work? So the real question is whether, before moving on, Marx was satisfied with his explanation of why the rate of profit tends to fall. The evidence leaves little room for doubt. In response to Michael Heinrich (who recently made arguments similar to Harvey’s), my co-authors and I presented ‘considerable evidence in Marx’s correspondence – spanning the period from 1865 to 1877 – that he was satisfied with his theoretical results and that he regarded Capital, not only the first volume that he published but also the volumes that remained unpublished, as a finished product in a theoretical sense’ (Kliman, Freeman, Potts, Gusev, and Cooney 2013) Heinrich has not responded to this evidence, and Harvey refrains from discussing it. Harvey’s inadequate understanding of Marx’s text is also what lies at the root of his charge that the LTFRP and theory of capitalist crisis rooted in it are mono-causal. He contends that Marx’s law is derived from a ‘highly simplified model[ ]’ that rests on a number of ‘draconian’ assumptions. That is, the law is valid only if all of the assumptions hold true in the real world. But by virtue of these assumptions, the law excludes all potential causes of falling profitability other than labour-saving technical change, and it excludes all factors that can keep the rate of profit from falling by counteracting the effect of technical change. Thus the law is mono-causal , as is any theory of crisis that employs it without combining it eclectically with extraneous factors. 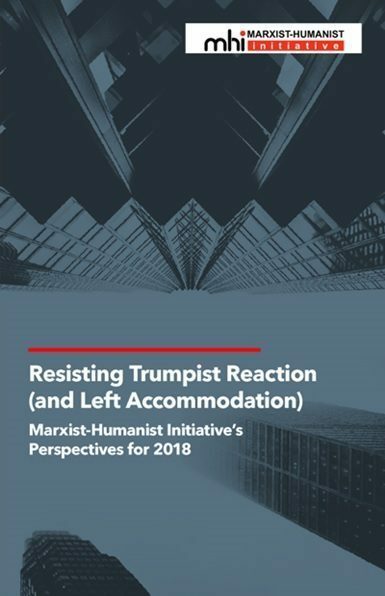 Yet Harvey acknowledges that the draconian assumptions are not to be found in Marx’s text: ‘While Marx scrupulously lays out his assumptions in Volume 1 [of Capital] he does not do so in the case of the falling rate of profit theory [in Volume 3]’. How, then, does he know that Marx actually made these draconian assumptions? In general, Harvey turns Marx’s law into a model that depends on a host of restrictive assumptions by construing the law as narrowly as possible. He does not regard the whole of Part 3 of the third volume, but only the material dealing with what Marx called ‘the law as such’ (das Gesetz als solches), as a presentation of the law. This makes the law seem mono-causal and disconnected from other phenomena and institutions that Marx discusses later in Part 3. It seems not to be a law that operates amid various counteracting factors and through the intermediation of the financial system (as I discussed above), but an other-worldly abstraction that can be called a law only under imaginary conditions that exclude and ignore so much that matters in the real world. Harvey says that Marx’s ‘exclusion[ ]’ of so much ‘severely restricts [the law’s] applicability’. Although he knows that Marx went on to introduce other phenomena and institutions into the analysis, his cordoning off of ‘the law as such’ prevents him from recognising this as evidence of the multi-causal character of the LTFRP. The introduction of additional phenomena and institutions into the analysis no longer seems to be a dialectical enrichment of the law that describes it in the concrete forms in which it manifests itself, but a tacit admission that the conditions which need to be present in order for the law to operate are not in fact present. The law seems not to ‘remain[ ] intact’. Marx seems to be engaged in a separate discussion from before, one concerned with ‘what happens when the assumptions made in deriving the law are dropped’. He seems to be calling the status of the law into question, exhibiting his ‘vacillation and ambivalence’. And we seem to be in need of a very different framework for crisis theory, an unstructured space populated by a host of potential explanatory factors and phenomena that have no intrinsic connections to one another, factors and phenomena too distinct from one another to be ‘cram[med …] into some unitary theory’. The text need not be read in this way. And since it need not, it should not; uncharitable reading is not good interpretive practice. Harvey is correct that Marx’s law is not the ‘absolute truth’ of capitalism’s dynamics. In other words, it is not their sole cause. It does not even account for every blip in the trajectory of the rate of profit. But that is not the purpose of the law. Its purpose is ‘merely’ to show that Marx’s value theory, in conjunction with his theory of capital accumulation, can account for the fact that the rate of profit tends to fall. The sentence I have just quoted comes from the first chapter of my book on the underlying causes of the Great Recession.5 Part of the next chapter ‘focus[es] on two intermediate links—low profitability and the credit system—that connect the fall in the rate to profit … to the latest economic crisis and slump’. (Kliman 2012, pp. 16–17) And chapter 3, devoted to the financial crisis of 2007–8, discusses the following: the Federal Reserve’s excessively easy-money policy after the dot-com bubble of the 1990s burst; securitisation of mortgage loans; subprime lending; home-equity lines of credit; rising loan-to-value ratios for mortgage loans; lenders’ rising leverage ratios and reduced capital requirements; the rise in household debt during the 1990s and 2000s; the psychology that gave rise to the dot-com and home-price bubbles; the disastrously incorrect forecasting models of the credit-rating agencies; Congress’ initial rejection of the TARP (Troubled Assets Relief Program) bailout; and the inflow of savings from abroad that made its way into the U.S. If this is Harvey’s best example of denial that financialisation was a cause of the 2007–8 financial crisis,6 or of a mono-causal approach, I would hate to see his other examples. Harvey, David. 2012. History versus Theory: A Commentary on Marx’s Method in Capital, Historical Materialism 20:2, 3–38. Howard, M. C. and J. E. King. 1992. A History of Marxian Economics: Volume II, 1929–1990. Princeton, NJ: Princeton Univ. Press. _______. 2012. The Failure of Capitalist Production: Underlying Causes of the Great Recession. London: Pluto Books. Kliman, Andrew, Alan Freeman, Nick Potts, Alexey Gusev, and Brendan Cooney. 2013. 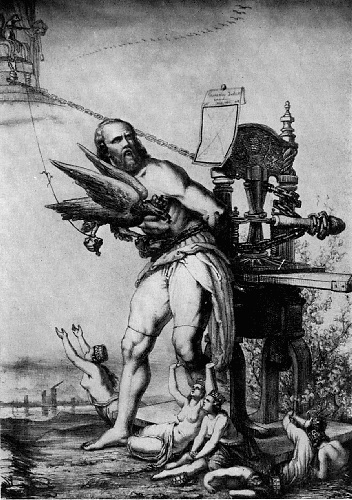 ‘The Unmaking of Marx’s Capital: Heinrich’s Attempt to Eliminate Marx’s Crisis Theory’. Kliman, Andrew and Shannon D. Williams. 2014. ‘Why “Financialisation” Hasn’t Depressed US Productive Investment’, Cambridge Journal of Economics. Print version forthcoming. Marx, Karl. 1990. Capital: A Critique of Political Economy, Vol. I. London: Penguin. _______. 1991a. Capital: A Critique of Political Economy, Vol. III. London: Penguin. _______. 1991b. Karl Marx, Frederick Engels: Collected Works, Vol. 33. New York: International Publishers. 1 See Kliman, Freeman, Potts, Gusev, and Cooney (2013) for a discussion of the law’s function and the meaning of ‘law’ in this context. 3 I am aware of the allegation that Marx’s derivation of these results has been proven to be internally inconsistent, but that is only a pernicious myth. See chap. 8 of Kliman (2007). 4 I think this analogy to Marx’s procedure holds strictly, point by point. The law of gravitation is the analogue of the LTFRP; the second law of motion is the analogue of the law of the determination of value by labour-time (‘law of value’). 5 Harvey cites my book elsewhere in his paper, but he provides no evidence or citation to support his version of what I claim. 6 Shannon Williams and I (Kliman and Williams (2014)) have shown that financialisation was not the cause of the fall in U.S. corporations’ rate of capital accumulation during the decades that preceded the Great Recession. That is of course an entirely different matter. The first part of this article focused on David Harvey’s interpretation (Harvey 2014) of Marx’s law of the tendential fall in the rate of profit (LTFRP) as capitalist production increases—a law Marx identified as ‘the most important law of political economy’. It remains to address Harvey’s belief that the LTFRP has not in fact been operative since the 1980s. What Harvey calls his ‘most important objection’ to ‘much of the falling-rate-of-profit literature’––once again, he is vague about the object of his critique––is the fact that ‘[p]rofit rates can fall for any number of reasons’. Therefore ‘[d]ata that show a falling rate of profit do not necessarily confirm the existence of the specific mechanism to which Marx appealed’ (labour-saving technical change). This is exactly right. Thus, when I considered the trajectory of U.S. corporations’ rate of profit from the end of World War II to the Great Recession and I concluded that ‘Marx’s law of the tendential fall in the rate of profit fits the facts remarkably well’ in this case, (Kliman 2012, p. 137) my conclusion was not based on the mere fact that the corporations’ rate of profit fell. It was based on a ‘decomposition analysis’ that separates out (decomposes) various potential causes of the fall and measures the effect that each one had on the rate of profit. Moreover, because the standard way of decomposing the rate of profit is not particularly appropriate when conducting a causal analysis (for a reason stressed by Harvey), I decomposed it in a different manner. Traditionally, the rate of profit has been decomposed into the rate of surplus-value (or ratio of profit to employee compensation) and a function of the value composition of capital (or ratio of the constant to the variable components of the capital-value advanced (invested)). This is fine in some contexts, but the nominal value composition of capital that researchers construct is different from the value composition to which Marx refers. It is affected not only by the relative amounts of value invested to acquire means of production and hire workers, but also by changes in the rate at which commodities’ money prices rise in relation to the commodities’ actual values. Because two different factors affect it, movements in the nominal value composition have no clear-cut, unambiguous meaning. For example, when the nominal value composition remains constant, as it did in the U.S. during the 1960s and 1970s, we cannot conclude that the relative amounts of value invested to acquire means of production and hire workers also remained constant. It is possible that relatively more value went to acquire means of production, which tends to raise the value composition, but that this effect was offset by accelerating inflation.3 As Harvey correctly emphasises, this is a ‘major problem’. movements caused by ‘everything else’. I found that, although the first two causes had been important during certain shorter periods, neither of them had a substantial effect on the rate of profit in the long term—that is, when we consider the postwar era as a whole. Almost the entire long-term fall in the rate of profit was therefore caused by changes in ‘everything else’. But once (1) and (2) have been set aside, it follows mathematically that ‘everything else’ is just the ratio of employment to the amount of capital invested in fixed assets, as measured in terms of labour time. Almost all of the long-term fall in the rate of profit is attributable to the decline in this ratio. In other words, it is attributable to the fact that employment consistently grew less rapidly than capital accumulated. This is precisely how Marx’s law explains the long-term tendency of the rate of profit to fall. Thus, the law accounts for almost all of the fall in U.S. corporations’ rate of profit. The ratio of profit to employee compensation had little effect on the rate of profit because it changed very little. (It fell a bit during the early part of the postwar period, but had no upward or downward trend between 1970 and the Great Recession.) It is important to emphasise that the long-term stability of this ratio is not a statistical mirage caused by the fact that the U.S. government classifies the pay of CEOs and other top corporate executives as employee compensation rather than as profit. Recent estimates of mine (see Kliman 2014b) indicate that re-classification of top executives’ pay as profit makes very little difference. Yes, their pay skyrocketed in recent decades, but there were simply too few top executives for this to have had much effect on the numbers. Between 1979 and 2005, the rising share of the product received by managers in ‘the 0.1%’ and ‘the 1%’ (the top 0.1 percent and top 1 percent of the income distribution) depressed other business-sector employees’ share by only 0.4 and 0.6 percentage points, respectively, according to my estimates. Another of Harvey’s objections to the falling-rate-of-profit evidence is that ‘[t]here is a gap between where profit (value [sic]) is produced and where it may be realised. … The patterns of … flows of capital and revenues are intricate and it is not clear that data collected at one point in the system accurately represent the movements in their totality’. He is correct once again. It would be wrong to conclude from the data discussed above––which pertain to the profitability of domestic capital investment––that there was a decline in U.S. corporations’ overall rate of profit, on foreign as well as domestic investment. My conclusion that the rate of profit fell was instead based upon consideration of both the foreign and the domestic accounts. Government data on U.S. corporations’ capital investments abroad and their profits from investment abroad are available from the start of 1983 onward. They indicate clearly that U.S. multinational corporations’ rate of profit on foreign investment trended downward substantially between the start of this period and the Great Recession (see Figure 2)4. Because the denominators of the domestic and foreign rates of profit measure somewhat different things, the two data sets cannot properly be combined, and thus we cannot ascertain the exact extent to which U.S. corporations’ overall rate of profit fell. However, the fact that both the foreign and domestic rates of profit declined does mean that we can be confident that the overall rate of profit did indeed fall. Harvey also notes correctly that U.S. multinationals use ‘transfer pricing’ to shift profits generated in one country onto the books of a subsidiary in a different country where they are not taxed or are taxed at a lower rate. He could have added the fact that multinationals’ foreign profit and investment data are attributed to the countries in which their foreign subsidiaries are incorporated, which frequently differ from the countries where production takes place and the products are sold. As a result, it is difficult if not impossible to know what the multinationals’ rate of profit in any particular country really was. But this does not matter insofar as the total picture is concerned. Transfer pricing schemes allow corporations to shift around profits and titles to investments, but they do not affect the total volume of profit or investment. Harvey claims that transfer pricing allows profits to be ‘disguise[d]’, but he provides no evidence and I know of no such evidence. Shielding profits from the reach of tax authorities is not the same thing as disguising them. The evidence discussed above pertains to U.S. corporations only. Harvey objects that ‘it cannot be taken as evidence of what is happening to global capital’. Indeed it cannot, but what makes this fact a legitimate objection in this context? The topic of his paper is the fall in the rate of profit as a potential cause of economic crisis, and he is well aware that the latest crisis began in the U.S. before it spread throughout the world ‘through contagions in a global financial system’. Since the U.S. was the epicentre of the crisis, and its subsequent spread elsewhere has a straightforward financial explanation, what we need to focus on is whether and how a fall in the U.S. rate of profit, not the global rate, was an underlying cause of the crisis. Harvey notes that profitability has rebounded substantially in recent years. Of course, post-recession trends have no bearing on whether a prior fall in the rate of profit was among the causes of the Great Recession. His point is rather that, since a measure of the rate of profit which fails to capture the post-recession rebound is suspect, what that measure tells us about a prior decline in profitability is suspect as well. I could not agree more, but all of the rates of profit I have computed (using more or less inclusive definitions of profit) do indeed capture the post-recession rebound. They all fell during the Great Recession—bottoming out 24 percent to 38 percent below their peak values of 2006––but by 2013, all of them had rebounded to levels close to or greater than those of 2006. The main cause of the rebound in profitability has been a sharp post-recession decline in workers’ share of the product, which in turn has been caused by companies producing more without increasing their workforces. It has not been caused by ‘wage repression’. Even after adjustment for inflation, employees’ hourly compensation has risen. Why does Harvey repeatedly stress that there are ‘conflicting forces’ and ‘multiple contradictions and crisis tendencies’? Why are we presented with the mono-causal LTFRP strawman? Notice what these two things imply when we take them together: since the law can hold true only if other causes of crisis and counteracting factors are assumed not to exist, we must jettison the law once we recognise that they do exist. Thus, as I noted in part 1, I suspect the talk of multi-causality is masking Harvey’s desire for an apousa-causal crisis theory. He is clearly not happy with the specific multi-causal theory of crisis that emerges, when all is said and done, from volume 3 of Capital––a theory in which the LTFRP remains intact and other determinants such as the financial system are linked to it and mediate the way in which it appears. Only a few years ago, Harvey had a much clearer understanding of the sentence and the passage in which it appears, and he took care to analyse it in context. After asking where the extra demand comes from that enables the surplus-value that has been produced to be realised in money form, Harvey (2012, p. 25) noted that ‘Marx’s answer is as surprising as it is ruthlessly honest. In a two-class closed society comprised of capitalists and labourers, there can be only one source of the extra demand and that is from capital, since exploited labour could never furnish it’. In other words, it is capitalist firms’ demand for additional means of production––investment demand––and capitalist households’ demand for consumer goods that allows the portion of output that contains the surplus-value to be sold. Harvey then quoted from and summarised much of the passage in question, in order to make clear that the shortfall in demand that characterises economic crises is not due to the restricted consumption of ‘the masses’ or ‘exploited labour’, since their consumption is always restricted––crisis or no crisis. Thus, blaming the crisis on the masses’ restricted consumption is like blaming an airplane crash on gravity (which always exists, crash or no crash). The shortfall in demand is instead caused by the fact that the extra demand that needs to come ‘from capital’ has temporarily stopped coming from capital. The key problem is that capitalism requires what Harvey (2012, p. 26) calls ‘continuous capital-accumulation’, i.e. additional investment in production, but a shortfall in demand occurs when and because the volume of additional productive investment is less than what is needed. Since Harvey knows (or at least used to know) all this, why has he suddenly taken the ‘restricted consumption’ sentence out of context and pressed it into the service of an underconsumptionist ‘wage repression’ theory of crisis that is alien to Marx’s actual and ‘ruthlessly honest’ account of the demand problem? Perhaps the answer is that the ‘ruthlessly honest’ account takes us straight back to the fall in the rate of profit. Once we understand that a lack of demand is almost always a matter of inadequate investment demand, we are led to ask why investment is inadequate, and this question leads to two further ones: Has the volume of profit (surplus-value) that has been generated large enough to fund an adequate level of investment demand? And is the expected rate of profit on the new investments of today high enough to bring forth investment in the volume that is needed? Inadequate profitability was a main cause of the long-term slowdown in U.S. corporations’ investment demand for productive fixed assets. Between 1948 and 2007, their rate of accumulation of fixed assets fell by 41%, while their after-tax rate of profit on fixed-asset investment fell by 43%. The only other factor that can influence the rate of accumulation is the share of profits that is re-invested in production; it actually rose a bit (3%). The entire decline in the rate of productive capital accumulation is therefore attributable to the decline in the rate of profit (see Kliman and Williams 2014 for further discussion). I am not ‘proclaiming that it is all a consequence of some hidden tendency for the rate of profit to fall’, as Harvey puts it. That would be wrong for two reasons. First, all manner of intermediate links and complicating factors have also been at work. (The Great Recession has also weakened businesses’ confidence in the future, to take just one example.) Second, the tendency for the rate of profit to fall is not ‘hidden’. As Hegel said, essence must appear, or shine forth, in the observable world. I think it has done so. Kliman, Andrew and Shannon D. Williams. 2014. Why “Financialisation” Hasn’t Depressed US Productive Investment, Cambridge Journal of Economics. Print version forthcoming. Marx, Karl. 1991a. Capital: A Critique of Political Economy, Vol. III. London: Penguin. 1 The data used to construct Figure 1 come from the U.S. Bureau of Economic Analysis: National Income and Products Accounts Table 1.14, lines 1, 4, 7, 9, 10, and 12; Fixed Asset Table 6.3, line 2; and Fixed Asset Table 6.6, line 2. Net operating surplus and after-tax profit are measures of profit. The denominator of both rates is accumulated investment in fixed assets, net of depreciation. Depreciation is valued at historical cost. 2 I shall limit these remarks to a discussion of my own analyses, since I am less knowledgeable about others’. 3 As Harvey notes, even the ‘real’ value composition of capital––the one to which Marx refers rather than the nominal one––is not purely an index of labour-saving technical change. In this respect, it differs from the ‘technical’ and ‘organic’ compositions. However, my estimates indicate that U.S. corporations’ real value composition tracked the technical and organic compositions quite closely. Between 1947 and 2007, the real value composition increased by about 120% while the technical and organic compositions increased by about 160%. Throughout almost all of this period, the relation between the different compositions of capital was even stronger than these numbers suggest. The difference in growth rates is largely due to brief periods (the latter parts of the 1960s and 1990s) in which exceptionally rapid wage growth temporarily depressed the real value composition. 4 The data used to construct Figure 2 come from the U.S. Bureau of Economic Analysis’ ‘Balance of payments and direct investment position data’ tables. The numerator of the rate of profit is ‘Direct Investment Income Without Current-Cost Adjustment’; the denominator is ‘U.S. Direct Investment Position Abroad on a Historical-Cost Basis’. The data are for ‘all countries’. 5 For further analysis of the passage, see pp. 165–67 of Kliman (2012). For discussion of the logical and empirical flaws of the underconsumptionist theory of crisis, see chap. 8 of the book.